REGISTRATION IS OPEN FROM 1ST OF APRIL TILL 26TH OF MAY 2017 Please register yourself now! We have only 130 places! Invitation for an international conference on the future of intercultural education and citizenship in Euro-Med region. It is our pleasure to invite You to participate in an International Conference “The challenge of intercultural education -Yesterday, today and tomorrow…” in Tallinn, Estonia, on 9th June 2017 held under the project EUROMED Education Without Borders, organised in cooperation between partners from European and Arab countries and co-financed by Anna Lindh Foundation, National Foundation of Civil Society, Estonian Ministry of Culture, Tallink Grupp and others. Conference is organised in order to discuss on high level event which connects a unique regional network of practitioners, policy-makers, media and international donors, united to create together real and lasting change in the face of the region’s most pressing problems. Also its place officially launch the project results (the toolkit and the web resource) and publicize the results as widely as possible. 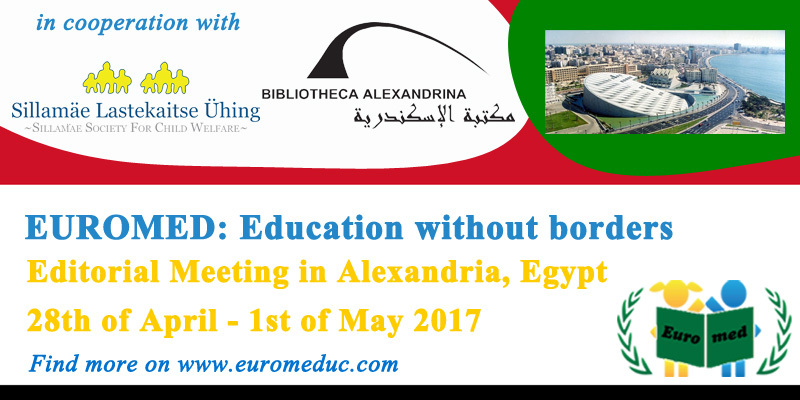 The editorial meeting of the ‘Euromed: Education without Borders’ project was held in Alexandria, Egypt on 28th of April – 1st of May 2017. The main focus of this editorial meeting was to finalize the web resource and complete the contents for the ‘educational toolkit’ with policies and best practices in English, Arabic and French. Meetings took place in the Bibliotheca Alexandrina (Library of Alexandria), a major library and cultural center. Members were given a guided tour around the vast expanse of the library, including the art exhibitions and a screening on ‘Culturama’. We listened to presentations from the Head of Networks and Outreach, and discussed potential future partnership opportunities and Egypt education, culture, youth and civil society policies and best practices. The more social aspects of the visit included visiting places of significance in the city of Alexandria, as well as a visit to Cairo, and one of the wonders of the world, ‘The Great Pyramids of Giza’. We managed also to meet with Anna Lindh Foundation staff to discuss future cooperation opportunities and project on going success. It was a positive and productive meeting, and we now look forward to the conference in Tallinn from 8-11th of June. Registration is already open!